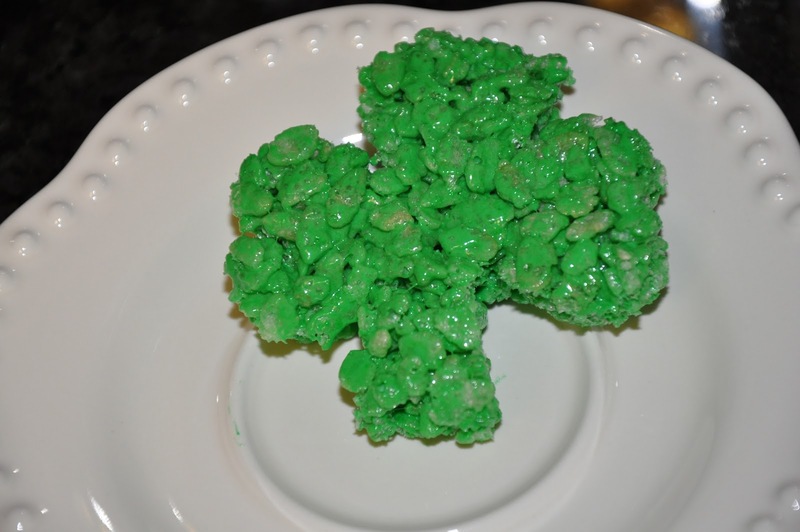 Elizabeth Ann's Recipe Box: St Patrick's Day Rice Krispies Treats! 3 St Patrick's Day Rice Krispies Treats! They are precious even if you don't have a shamrock cookie cutter and just cut them into squares! Melt margarine or butter in large saucepan over low heat. Add marshmallows and stir until completely melted. Remove from heat and stir in green food coloring. Mix in Rice Krispies cereal. Stir until well coated. Spread the mixture using a buttered spatula or waxed paper evenly into a 13x9x2 inch pan coated with cooking spray. Cut into 2 inch squares (or use a shamrock cookie cutter) when cool. Those are so super cute!! I love making different shapes/colors of Rice Krispy Treats!